Twenty-five years ago today as I write, on Wednesday Sept. 25, 1991, Diane and I were brand-new to married life, having gotten hitched the previous Friday in Philly’s Chestnut Hill neighborhood. 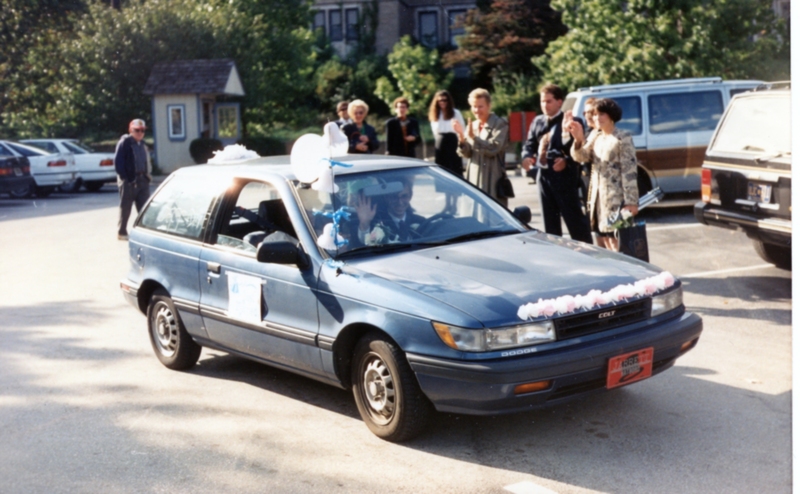 It was, suffice it to say, a great day – up until we walked out of the French restaurant where we held the wedding: my brother and a friend had decked out my car, a Dodge Colt, in festive wedding gear, and tied empty cans to the back. That centuries-old tradition sounds charming, I suppose, but try driving with said cans clanging on Chestnut Hill’s cobblestone streets… as Bill the Cat might say, “Ack!” At the first opportunity, I cut ’em loose. Anyway, we waited until the following spring for our actual honeymoon, a wondrous California odyssey, and spent the weekend down the shore. We already lived together, so the adjustment was minimal – changing our W-4s was it, I think. Yes, that’s a lot of CDs; and the number only increased, as they spawned often. 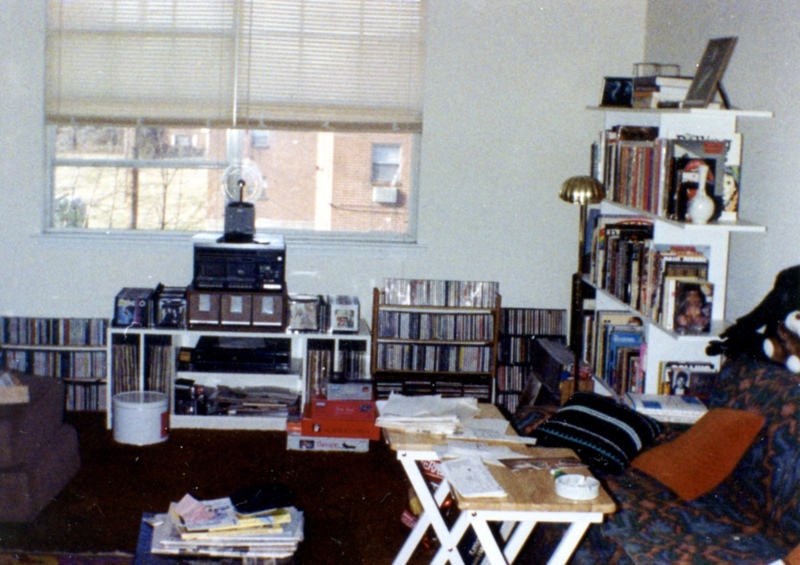 By decade’s end, they took over that end of the living room. Although I don’t remember the specifics of this particular Wednesday, I can still lay out a large chunk of what happened based on routine: I woke around 6:30, left at 7:35am, arrived at work 10-15 minutes later, and then sat at a desk for a spell. Those were the days of hour-long paid lunches (what a concept! ), and I made use of the time by heading home most middays. Without morning traffic, it took 10 minutes each way. 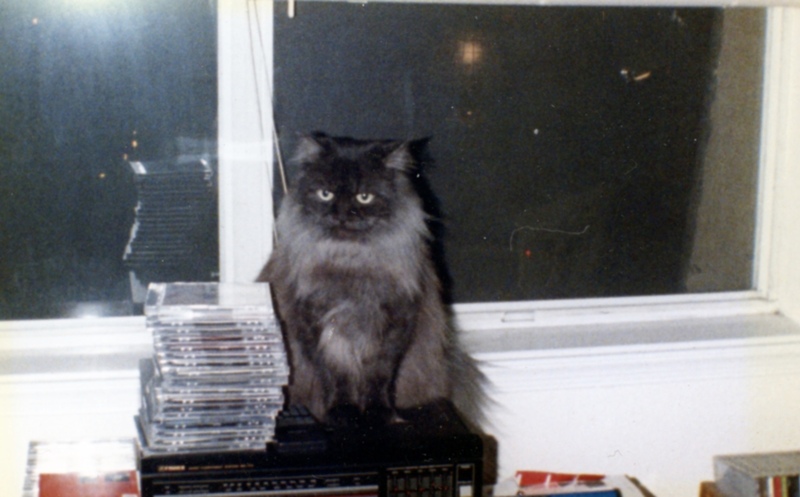 I brought in the mail, likely indulged the original old grey cat, Smokey, with a few treats, and worked on the Great American Novel, which I spent much of the ‘90s writing, re-writing and never completing. That’s to say, in addition to a cat, we had a computer – a second-hand x286 IBM clone. It came with an eight-gig hard drive, 256MBs of memory and a modem, which meant we could, and did, connect to the sandboxed universe of Prodigy. My dad, God bless him, dumbed down the DOS operating system for us and installed a simple menu, so accessing a program was never more than one or two keystrokes away – as in, A, B, C, D or E. For me, at lunchtime, that meant firing up the word processor and tap-tap-tapping away. The top movie of 1991 was The Silence of the Lambs, which Diane and I saw while down the shore for a week in the spring. (We read the book and Red Dragon, the novel that preceded it, in the same week. Yes, we were eyeing everyone with suspicion.) Other popular films included Beauty and the Beast, Terminator 2: Judgment Day, Point Break and Hook, none of which interested me then or now; and Thelma & Louise. On the economic front, America was teetering: unemployment averaged 6.8 percent for the year and inflation, at 4.2 percent, was a source of concern as January dawned, though it (thankfully) fell over the next 12 months. Still, there was reason to rejoice: the USSR officially disbanded on December 26th and, with it, the Cold War came to an end – at least, it came to an end for a time. We’ve recently seen the rich man’s Hugo Chavez, Vladimir Putin, upping Russia’s nationalistic ante as a way to distract everyday Russians from their own economic woes; and those dupes who’d play cards with him, such as Donald Trump, apparently have no clue that he’s dealing from a stacked deck. Back on point: In the music-history books, 1991 is heralded for the breakthrough of the paradigm-shifting Nirvana, whose influential Nevermind was released 25 years ago yesterday. I’d love to say that I was among the first to buy it and take the music to heart. I wasn’t. I was in a different mind-space, as my list below shows. That’s not to say I didn’t and don’t appreciate the immediate impact and lingering influence of Nevermind; if I was creating an objective list for the year, I’d rank it No. 1. I’m not, however, so I won’t. 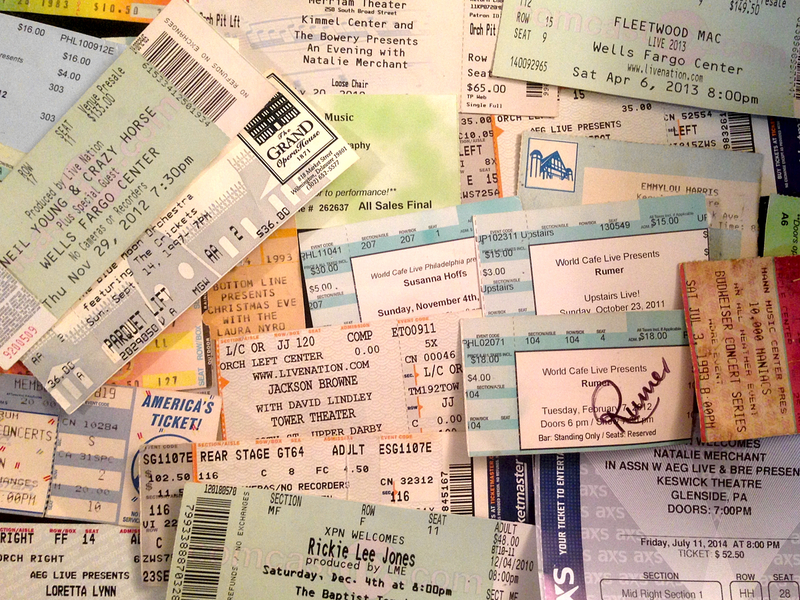 Before I get to the list: My main music-related memory from 1991 isn’t of an album, but of two sterling shows that we saw in the span of a few weeks, both at the TLA in Philly: Rosanne Cash on her Interiors tour; and the Irish singer Mary Black on her Babes in the Woods tour. Rosie’s was, as Dan DeLuca phrases it in his review, “an ‘I can’t remember the last time I saw anything this good’ show’; and Mary Black’s was as magical. (I reference it in this Of Concerts Past post about her 1994 show at the Chestnut Cabaret.) Other shows we saw in 1991: Elvis Costello with the Replacements; Emmylou Harris with Chet Atkins; Kathy Mattea with the Nitty Gritty Dirt Band; Roger McGuinn; Bonnie Raitt with Chris Isaak; and K.T. Oslin with ex-Byrd Chris Hillman’s group, the Desert Rose Band. There were plenty of others. For today’s Top 5: 1991. 1) Mary Black – Babes in the Wood. Selected track: “Still Believing.” I mentioned that memorable show of hers above because, looking back, I’m sure that live experience played a major part in my picking this as my favorite of the year. To this day, whenever I play the CD – or, now, stream it – I’m transported to the TLA, seated about halfway back, with Diane by my side. 2) Neil Young & Crazy Horse – Weld. Selected track: “Hey Hey, My My (Into the Black).” Now, this is my idea of grunge. Neil Young returned from the wilderness in 1989 with the stellar Freedom; followed it the next year with the raucous, Crazy Horse-infused Ragged Glory; and put a cap on his comeback with the electric tour captured on Weld, which could well be summed up in two words: brutal grace. 3) Matthew Sweet – Girlfriend. Selected track: “Divine Intervention.” One of my most-played albums of ’91, which is saying something as it was released in October of that year. This track, like the album as a whole, is delightfully trippy – and very Beatlesque. 4) John Mellencamp – Whenever We Wanted. Selected track: “Whenever We Wanted.” This, Mellencamp’s first release of the ‘90s, bypasses much of his late ‘80s Americana stylings in favor of the crunchy rock of Uh-Huh; and often substitutes sloganeering for the incisive short stories that accent Scarecrow, Lonesome Jubilee and Big Daddy. That said, a handful of songs – including this cut – stand with his greatest work. 5) Soundtrack – Falling From Grace. Selected track: Nanci Griffith’s “Cradle of the Interstate.” So John Mellencamp made a movie. I have no idea if it was good, bad or mediocre, as I’ve never seen it., but I can say without equivocation that the soundtrack – which preceded the film by a few months – was uniformly excellent, featuring tunes from Mellencamp, Dwight Yoakam, Larry Crane, Lisa Germano and Nanci Griffith. 7) Lisa Germano – On the Way Down From Moon Palace. Selected track: “Riding My Bike.” Germano, of course, came to the fore as the fiddler in Mellencamp’s band – and is a phenomenal fiddler. This jazzy solo effort is likely not to everyone’s taste, but I enjoy it. 8) Blake Babies – Rosy Jack World. Selected track: “Temptation Eyes,” Juliana. John. Freda. What else need be be said? Last night, we saw Garland Jeffreys, Marshall Crenshaw and Jonathan Edwards at the Ardmore Music Hall in Ardmore, Pa. – a club known, years ago, as the 23 East Cabaret. It was a somewhat odd, though enjoyable, show that found the veteran singer-songwriters sharing the stage in a round-robin format. Garland was Garland – i.e., great. Edwards, whose work I am unfamiliar with, was talkative and funny, and good on the harmonica; the audience enjoyed him. Crenshaw, for his part, was subdued; he never quite connected, perhaps due to playing almost all (relatively) new songs. At evening’s end, and this was the strange part, the three filed off stage – and never returned for the planned encore. Instead, they were waylaid by fervent fans (not us!) seeking to have their photographs taken with them. Anyway, the night got me to thinking: I never made it to the 23 East Cabaret before it shut down in 1994, but I did make it quite often to its younger (by a year) sibling, the Chestnut Cabaret in West Philly, including its final show, on June 17, 1994. That was Mary Black, the Irish singer. Now, we’d seen Black in March (maybe April) of 1991 at the TLA – a sold-out show, or close to it. At the time, she was touring in support of her Babes in the Wood album and seemed on the verge of becoming more than just a niche act in the States. On stage, she was poised, confident and, backed by a note-perfect band, spellbinding. The environment helped, too: the TLA had movie theater-styled seats in those days, so it was comfortable. You sat back, relaxed, and let the music wash over you. – and singing a song on her own, too. She released the solid Holy Ground album in 1993 – not quite on a par with Babes, but it commanded its share of airplay on WXPN, Philly’s adult alternative radio station. This 1994 show had the makings of another magical night, in other words. But on the drive into the city to meet Diane and friends for dinner on a warmer-than-normal mid-June afternoon, I heard something remarkable on the radio: an arrest warrant had been issued for O.J. Simpson in connection with the murders of Nicole Brown Simpson and Ronald Goldman; and Simpson was nowhere to be found. The third, and fatal, bad sign: the silent TVs near the bar were tuned to CNN, which was all-O.J. As the night wore on, many people – including me – drifted from the concert floor to the TVs to check for updates. Thus, my main memory of the night is of standing with a dozen-plus other men watching O.J. Simpson’s white Bronco lead a phalanx of police cars on a low-speed chase down a California highway. Mary Black, in the background, sang one of her new songs – “Lay Down Your Burden,” possibly, though I can’t say for sure. Oh, and one more memory: I bought, and drank, the venue’s last (over-priced) bottle of Miller Genuine Draft Beer.